JJM Professional Plumbing and Heating - Plumber based in Thomlinson Road, Durham. 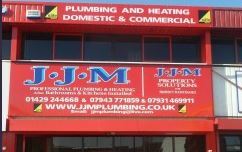 Here at JJM professional plumbing+heating we are a family run business with over 20 years experience in the plumbing and heating sector. We cover both domestic+commercial work anything from a dripping tap to a full central heating system,. Along with our friendly office staff we also have a boiler showroom where the public can call in to see us have a coffee and browse our products before they buy. Please visit our website www.jjmplumbing.co.uk to see our range of desgins and installations.